Andy Sernovitz from the Blog Council understands word of mouth better than almost anyone in business today. He recently sent a gift to say thanks for participating in BlogWell. He knows that if you send someone a pound of candy, they’re likely to appreciate it. If you send two pounds, they’ll tell their office mates and share the candy. 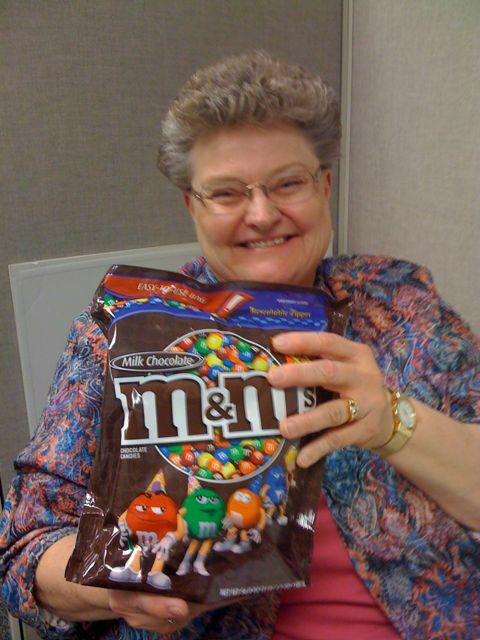 But if you send a three-pound bag of M&M’s they’ll do a blog post with a photo. Our friend and WOM guru Andy Sernovitz is hosting a small-group word of mouth marketing seminar in Chicago July 30 and Sept. 4. Usually he only does private training for companies at a very large price, so this is a rare chance for 50 people to get the best introduction to word of mouth that there is. Use the code “welovemayoclinic” when you register and you’ll get a $250 discount. This looks like it will be another strong event. I’m part of Day 1, just after Michael Rudnick’s address. Andy Sernovitz of GasPedal will deliver the afternoon keynote, and Duncan Wardle from Disney Parks will keynote Day 2 (here are some highlights of a presentation I heard him give earlier this month.) I know you’ll enjoy Chris Heuer from the Social Media Club, Paula Berg from Southwest Airlines and the Best Buy guys. The other case studies should be interesting, too. If you register by May 1, you save $400. Since I am one of the speakers, you can save another $200 by using the code “SPK” when registering. Advanced Learning Institute is sponsoring the event. I’ve attended and presented (and blogged) at several of their previous conferences. Knowing or having heard several of the speakers, I’m confident you will find it worthwhile. I hope to see you there!